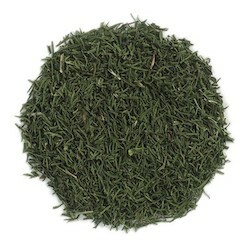 Aromatic dill weed is more delicately flavored than the seed from the same plant. It enhances rather than dominates and is delicious in salads, sauces, light gravies and with fish and grains. Directions: Dill is best when added at the end of cooking, or in recipes that require little or no cooking, because the longer you cook it, the weaker its flavor. For that reason, dill weed is successfully used in quick-cooking sauces, salads and dressings, while dill seed is suitable for dishes that require longer cooking. Dill's flavor has been described as a mix of anise, parsley and celery, its aroma as a combination of citrus, fennel and mint. The color and more delicate flavor of dill weed enhance rather than dominate a dish. While Dill's claim to fame is the dill pickle, it's also excellent with fish, in salads (potato, coleslaw, macaroni) and salad dressings, dips, sauces and gravies, cottage or cream cheese, breads, soups, and protein dishes. Also try it in sweets like cakes, pastries and apple pie and with vegetables like beets, cabbage (especially sauerkraut), avocado, eggplant, parsnips, pumpkin, squash, broccoli, cauliflower, turnips, potatoes, green beans and tomatoes. Blend 1 to 2 tablespoons of dill weed with softened cream cheese to create a tasty dip. Processing Notes: Dill weed is dried by laying the whole plant on vented racks inside a drier unit at a 30 degree angle. The rack's vented surface and angle of placement allows air to circulate freely through the plant material. Heated air (not exceeding 110 degrees Fahrenheit) is circulated through the drier, while a dehumidifier removes moisture. It is necessary to expose the plants to both a heat source and a dehumidifier to prevent them from molding or decomposing in their own moisture. The plant material remains in the drier until a moisture level of approximately 8% is reached. After drying, the leaf and stem is separated from the dill tops.